The extremely adaptable potato tastes great in almost any avatar - boiled, mashed, baked, fried, stewed, or curried. It combines well with vegetables, and many are the relieved housewives in this country who rely on the old faithful aloo or batata to pep up a boring meal or create a quick snack. While potatoes can be cooked in hundreds of ways, depending on regional taste and inclination, they can also add volume and interest to any number of vegetables. And fortunately, even the fussiest eater will never refuse a potato! Potato is one of my favourite foods.I loved putting this book together....Aloo chaat,Rosti Pizza,Cream of potato soup,Moghlai Aloo,Kapi Cho Potato are just a few of the recipes featured inside. In this book, I have compiled recipes of my favourite Starters/Chaat, Salads, Soups, Indian potato dish, and International potato dish. 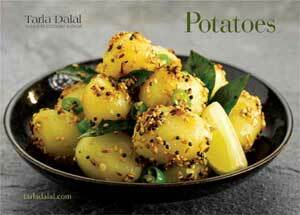 As integral a part of Indian cuisine though they are, potatoes are not an indigenous vegetable. Though at least 200 varieties of potato are grown around the world, they all have evolved from a single species cultivated by South American Indians in the high sierra of the Andes centuries ago. Spanish and English explorers who reached South America were the first Europeans to eat potatoes, and introduced the amazing tuber to Europe and England in the mid-1500s. Soon their use spread to Ireland, Scotland, and other countries across the globe.